It's been rumored that the reason that J.R.R. 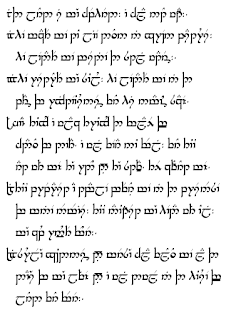 Tolkien wrote "The Hobbit" and "The Lord of the Rings" is because he was a fanatic linguaphile and wanted to have an outlet for his love of languages. He also desired to create a mythology. And so he did. I actually have a book that explained the lingual work Tolkien did, call "The Languages of Tolkien's Middle Earth". I bought it when I was highschool and the binding's just about to fall off from so much reading. As for languages, I know...1. And some change. I took 4 years of German between High School and college, but don't remember much of it. I wish I did. I've subscribed to Google(tm) News, German to try to improve my reading comprehension. But, unfortunately, I don't have the time to sit down and read it. Likewise, with Biblegateway.com, I've got a copy (or 3) of the Bible, auf Deutsch, right there at my finger tips. I would like to take some time each day to try to read from that and use it to study. Something like that would help me to not only better read German, but it would help to slow down and study God's Word. Dual benefit! And seeing the Runic font on the map. I was so much fun taking the map and the key to the Runic alphabet included in the player's guide and figuring out the names of the places on the map. Given that, at that time, I didn't actually own a computer, I couldn't do much with it while I wasn't at the computer lab. And so that's what I did -- entertained myself with the player's guide (and there was much to keep me entertained!). I learned the Runic alphabet, which made playing the game that much more fun. Ultima 5 was, by far, the best game of the series. Before games focused on graphical spectacularness, U5 had good story and was so much fun to play. And journey back to Britannia. I did hardly know it. It had been sitting on my desk for quite some time. We had it around to test stuff for Mac OS X. One day we went to power it up to try something, and for whatever reason, it would never power up. My manager told me to surplus it, but I....I had other plans. I was going to pay to get it fixed and do some playing with OS X. I'd had Mac-lust for some time, and I figured that this would be the chance to do something about it. I'd take it and use it for a bit and see how it went. Well, it sat there for months and months, with nothing ever being done with it. Until a couple of weeks ago. I saw it sitting there, and just for giggles, thought I'd try to power it up. So I did, and, much to my surprise, it came up. So I took it, put a clean copy of OS X on it, and brought it home. Until last week when I was waiting on a co-worker. I had nothing to do while he finished some stuff up, so I grabbed the aforementioned laptop and tried to see how Ubuntu Linux would install. It installed beautfully! And, I was in love. It's something I'd wanted to do for sometime....Linux running on Apple hardware. And so, I decided that that would be my "play" machine; the one that I would bring home and experiment with. And play we did. I got to do some cool things. Honestly, there were some things I didn't like -- the lack of functionality in the trackpad (I wanted to "tap" it to emulate left-clicks, and, more than that, I wanted to use it for scrolling purposes. I also did NOT like the one-button mouse layout, which meant I had to use F11 and F12 for middle- and right-click capability, respectively). There was also the lack fo java and flash for it. But, it was still cool, and hey! I could watch DVDs on it. So, having not problems for a few days, I made the brilliant move to bring it do DC with me. You know, instead of bringing the one that hadn't sat on my desk for several months in an assumed dead state. The train is where the problem began. I was in the dining car blogging, and had to get up to go to the restroom. When I came back, the whole thing was frozen. I assume it was from the bumps and shocks from the train. So I powered it down, then tried to bring it back up. I could hear stuff happening, but saw nothing. Tried a couple more times to no avail. Gave up and put it away. Got to the hotel, powered it up, it came up fine. Was able to do quite a bit on it till I watched my X-Files. Then it froze again. After that, I could sometimes get it to power up and could do a little bit on it, but inevitably, it would freeze and go a long period where I would try to boot it up and see nothing. Today, however, even after letting it sit untouched for a while, there were no visible signs of life. Audible, granted, but nothing visible. It may just be a matter of getting a new display, but they ain't cheap. I imagine that's especially true for a mac. Well, it's John 52:54 if you believe the writers of the X-Files. In reality, it's John 6:51. American Standard Version for anyone keeping score. (Update....the Scripture quoted the episode is actually John 6:54 -- I thought I had checked that, but apparently not. I believe he quotes is correctly from the KJV). OK, so this is a bit odd to be blogging about. Some background information. The Scripture and quoted "reference" are from a second season episode of the X-Files called "3". The basic premise of it is, there are a group of supposed "vampires" in LA (big surprise there, crazy Californians), and, taking Christ's words completely and illogically out of context, they believe that, by going around drinking the blood of other people, they will gain immortality. After one such attack (the first in 3 years, if I recall correctly), Mulder comes to the house to investigate. 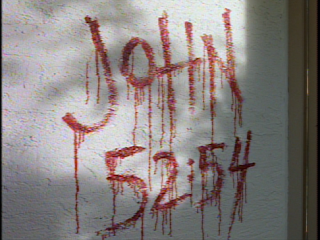 There, written in blood on the wall, is "John 52:54". Mulder then goes on to quote (paraphrase is the better word, as it's not exact. Or not exact to any of the translations I'm aware of) the "referenced" Scripture, followed by the line (or close facsimile thereof), "they have the same feeble literal grasp of the Bible that all those big-haired preachers do". So, I recognize that the episode originally aired ~12 years ago, but I'm just now watching the X-Files in its entirety on DVD. As I was watching it, the image at the top of the page interested me. At first I didn't know quite what to make of it. There are only 21 chapters in John, so it jumped out at me as odd. Was that supposed to be a Scripture reference? As mentioned, Mulder went on to "quote" the Scripture, which led me to know that yes, this was supposed to be a Scripture reference. So my next question is....why? The X-Files, like so many other shows have been known to use fake telephone numbers (the '555' prefix has become somewhat of a joke to many nowadays it's become so cliche`). They've also been known to use fake cities/locations in their episodes. Neither of those things I can fault them. But, I really don't understand why they would use something like "John 52:54" as the reference for a very existent verse. If you're going to quote the Scripture, you should at least get the book, chapter, and verse correct. I don't know why 1) they would falsify it and 2) they would falsify it so blatantly. If you're looking for a non-existent chapter of John, why not John 22? Why choose 52? That seems a little extreme. But, I still question the reason behind choosing a fake chapter at all. I don't know. I've got a copy of the most excellent book "Nitpicker's Guide for X-Philes" at home and hope to look into it as soon as I get a chance. It just seems really odd to me. The referenced article talks about schools in the U.K. who have stopped teaching the Holocaust because it might offend Muslims who deny the Holocaust happened. I....I can't even BEGIN to describe how this makes me feel! I just can't understand what...why this is a good idea. Do we rewrite history to avoid offending people.